Later this month, Robert Woodhead Ltd will begin work on a brand new development on Victory Road. 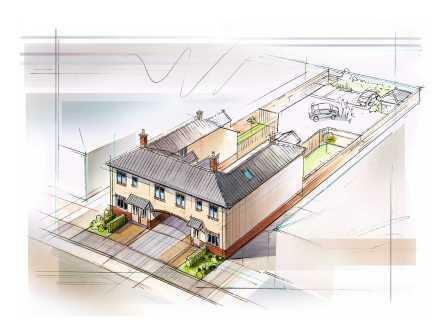 The five new homes have been commissioned, and will be managed by Derby Homes, The design has been selected following consultation with the local community, and in response to the local housing need. When asked, 88% of residents in the area said they would like to see the land used for new housing. Smaller homes were proposed due to the greater need for this type of housing within the area. Robert Woodhead Ltd, is an award-winning family-owned and operated firm, with a record of delivering high quality social housing schemes. The company has already been working closely with OSCAR (Osmaston Community Association of Residents) and Derby Homes to find out more about the local community, and answer any questions or concerns about the work itself and the future of the site. Robert Woodhead’s Site Manager at Victory Road, Paul Pygall, said: “It’s important to us that we meet the local community and keep them informed about what to expect from our time on site. “We will be keeping local people informed through OSCAR during the build and working alongside them to maximize the positive impact the project will have, not just on our site, but to the community as a whole.” Work will begin on the four two bedroom houses and one bedroom flat in late May 2014, and is expected to be complete by early 2015.